The Galápagos tortoise is the largest tortoise in the world. It can weigh over 400kg (880 lb) and grow over 1.8 metres (2 yards) in length. 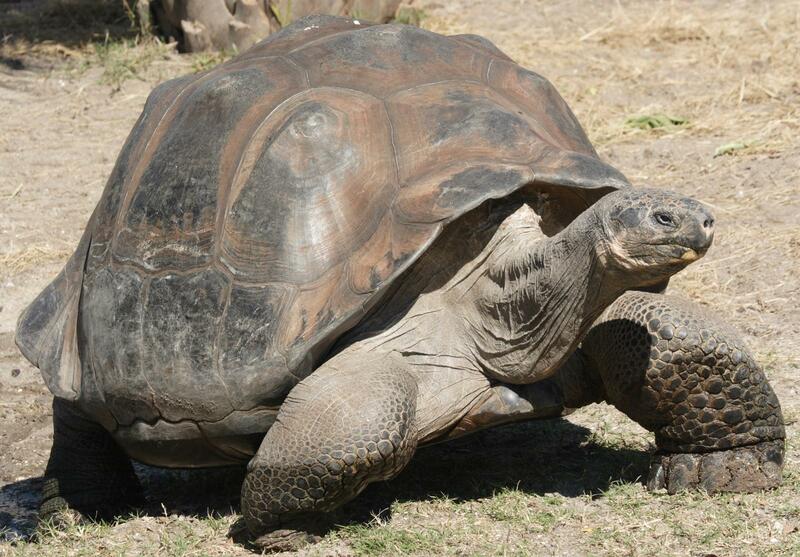 This mighty tortoise has a life span of more than 100 years. This gigantic tortoise can carry a man on top of himself. What a strong tortoise it is! The oldest one reached to at least 170 years old. The tortoise is native to seven volcanic islands of the Galápagos which is situated west of Ecuador. The Galápagos Islands were discovered by Spanish sailors in 1535 and they named the islands after the saddle. The tortoises’ shells reminded them of a kind of saddle called a galapago. 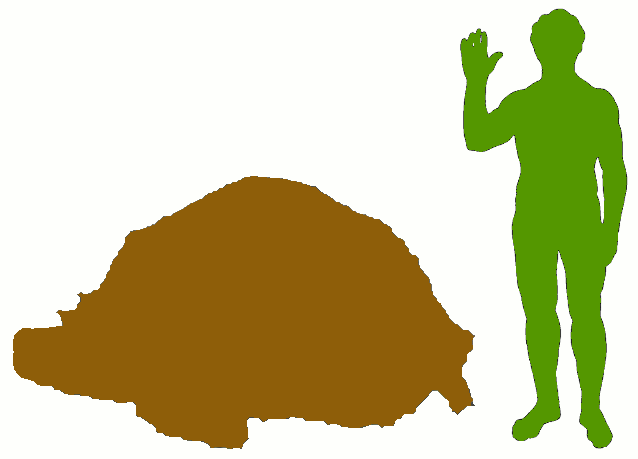 The size and shell shape of the tortoise are different based on where they live. Galápagos tortoises are endangered. The total population of tortoises have dropped from over 250,000 in the 16th century to 20,000 now because of human activities like hunting and deforestation for agriculture. 7 subspecies out of the 10 can be found in the wild and one other subspecies is represented by a single remaining male called Lonesome George. Lonesome George is the world’s rarest living creature and he is called “lonesome” because he is the last of his subspecies. All Galápagos tortoises are descended from distant ancestors which arrived from mainland South America. Many years ago, perhaps, some pregnant female tortoises floated to the Galápagos Islands on clumps of vegetation across the ocean from the South America. These tortoises would have been able to survive the long journey, even though it would have meant months without food and fresh water. A cold sea current that flows north-westward along the west coast of South America and would have helped these giant tortoises to arrive at their new destination on the Galápagos Islands. The closest living relative of Galápagos tortoise is the Argentine Tortoise which is much smaller in size. It is found in Argentina. The tortoises have a large bony top shell. It has a dull brown colour. Their backbone, breastbone and ribs have become part of the shell. You can never separate the tortoise from its shell. Grey or yellow moss (Lichen) can grow on the shells of the slow-moving tortoises. The tortoise is able to protect itself by drawing back its head, neck and front legs into its hard shell. It has legs which are big and stumpy. It is covered with dry scaly skin and hard scales. The front legs have 5 claws and the back legs have 4 claws. Different types of Galápagos tortoise have different shell shapes. The first shell shape is a saddle shape. A saddleback tortoise has a shell which looks like a saddle. A domed tortoise has a shell which looks like a dome. The intermediate tortoise has a shell shape which is halfway between a saddle and a dome. There used to be 15 subspecies Galápagos tortoises. But now, there are only 11 of them. The smallest giant tortoises is the saddleback tortoises. The largest of the tortoises are the dome backed tortoises. The different subspecies were separated into different islands. They live in different habitats. The size and shell shape of the tortoise are different based on what they eat and where they live. Galápagos tortoises which live in the island with lots of low lying vegetation tend to have dome shells and are larger. They have shorter necks and legs because they do not need to reach high for food like the Saddleback tortoise. Dome shaped tortoises live on the higher ground of the island where it is cooler and wetter. This is because they are better able to resist cooler temperatures. The saddleback tortoise which loves to eat cactus has longer necks and legs. The long necks and legs will help the tortoises to reach up and bite tall cactus plants. They tend to have shells that allow the upward movement of the neck with a flared ridge on at the front of the shell. They are smaller than domed shaped tortoise. The saddleback tortoise live on the hotter and drier islands of the Galápagos Islands. Since tortoises are reptiles, they are cold-blooded. They bask for 1-2 hours after dawn to absorb the sun’s heat through their dark shells before actively searching for food for 8-9 hours a day. They travel mostly in the early morning or late afternoon. They are able to walk slowly at a speed of 0.3km per hour (0.2 miles per hour). Galápagos tortoises are quiet, peaceful animals that sleep nearly 16 hours per day. What sleeping beauties they are! On the larger and more humid islands, the tortoises seasonally migrate to lower ground which is covered with grass during the wet season, and to higher ground which is a meadow in the dry season. This seasonal migration has been going on for many generations. As a result, the tortoises have created well-defined paths through the forest which are called a “tortoise highways”. On the wetter islands, the dome-shaped tortoise are often seen in a large herds. They love company, unlike the more solitary and territorial saddleback tortoises. At times this tortoises will wallow in the mud or big rain puddles when they want to warm up during cool nights. This act of wallowing in the mud also help them to get rid off mosquitoes and ticks. They are also able to get rid of the mosquitoes and ticks when they bathe themselves with dust in the loose soil. During the night, these tortoises will rest under overhanging rocks. The giant tortoises mostly just eat plants. They eat cactus, grasses, leaves, bananas, apples, vines and other vegetation. They get their drink from the dew and sap in the plants. On dry islands, tortoise will lick up the morning dew from boulders. As a result of the continuous licking by the tortoises for many years, many rocks have half-sphere-shaped sunken holes in the surface. They can live for 18 months without food and water. During times like that, they survive by breaking down their body fat to produce water. They may also quickly drink a lot of water when they are thirsty. They will store the water in their bladders and in their necks. This unique characteristic made them a useful source of water on ships. Galápagos tortoises are not deaf, but they depend more on their sense of smell and vision to carry on with their daily lives. Galápagos tortoises enjoy a friendly relationship with certain birds, called finches. The tortoise will extend its neck to allow the finch to pick off the ticks on its neck, back legs and the skin near the shell. Picking ticks is not a tedious task for the finch because they love to eat them – but once in a while, the tortoise plays a nasty trick. It will wait until the bird goes underneath its body, then suddenly sit down, squashing the poor bird! It then eats the squashed bird – perhaps because it needs some extra protein. The mother Galápagos tortoises have to walk several kilometres in July to November to reach their nesting grounds, which are dry and sandy. They may take many hours and many days to dig a hole. It is a tiring job for the mother Galápagos tortoises. They use their rear legs to dig a 30cm (1 ft) deep hole to lay their eggs. They are able to lay up to 16 eggs. The eggs weigh from 80 to 160 grams (2.8 – 5.6 oz). The eggs are the size of billiard balls. Hatchlings will dig their way to the surface of the sand after 4-8 months from December to April. They weigh only 50 grams (1.7 oz) and are about 6cm (2.4 inches) long. The poor hatchlings will take several weeks to dig themselves out of the ground! In very dry areas, they may die underground if they are buried by hardened soil, and if there is a flood in the nesting area, they may be drowned. Initially, it is hard to identify the which type of Galápagos tortoise the baby is, because all of them have a dome-shaped shell. The young tortoises stay in warmer low ground for their first 10-15 years. They face all kinds of risks, like falling into cracks, being crushed by falling rocks and extreme heat. Is The Galápagos Tortoise Endangered? The only native natural predator of the Galápagos tortoise is the Galápagos hawk. The hawk preys on the Galápagos tortoise’s eggs and the hatchlings. The main threats to adult tortoises are habitat destruction and illegal hunting. When they were first discovered in the 16th century, there were about 250,000 Galápagos tortoise. After several decades of human hunting of the tortoise as a food source, there is only about 20,000 Galápagos tortoises left on the Galápagos Islands. These slow moving giant tortoises were collected and kept on board of the ships by sailors who needed fresh meat to eat. Not only did the tortoises provide the protein, their diluted pee could also be used as drinking water – although I would not want to drink tortoise pee! Sailors added the Galápagos tortoise to their food source because these tortoises can survive for more than a year without eating and drinking. They do not need to be fed or cared for. It didn’t cost anything to keep the tortoises on board the ship. Therefore Galápagos tortoises were highly in demand by the sailors, pirates, and whale hunters. They would stop at the Galápagos Islands to refill their food and water. These groups of people who came to the Galápagos Islands to refill their food and water also brought along with them pigs, goats, horses and cows, which have become another threat to the tortoises. They ate the little vegetation that existed on the islands. As a result of that there was a shortage of food for the tortoises. The animal’s hooves crushed the tortoise’s eggs. On top of that dogs, cats, rats and pigs eat tortoise’s eggs and the hatchlings. The tortoises were also hunted for high grade turtle oil from the late 19th century. These oils were said to be of equal value with cod liver oil. Clearing the islands to make room for farming, fruit plantations, tourist resorts and human settlement have destroyed lots of the turtle’s habitat. As a result of the hunting and lost habitat the total number Galápagos tortoises has dropped drastically. Without any efforts to conserve these tortoises, future generations will never have the chance to see a real life Galápagos tortoise. They will become extinct in the wild. Now, the Galápagos giant tortoise is strictly protected. In 1959, all uninhabited areas in the Galápagos became National Parks and a Research Station was established. At the time, all 11 remaining species of tortoises were endangered. In 1970, all hunting for tortoises and their eggs were banned. The exportation of tortoises were considered illegal. A 1971 Ecudorian decree made it illegal to destroy, remove or disturb any organism, rock or natural object in Galápagos National Park. The Charles Darwin Research Station in the Galápagos started a tortoise rearing project. They collected tortoise eggs from threatened nesting areas on the islands and brought them back to the station to be taken care of – to make sure that they survive and grow into beautiful healthy tortoises before they are reintroduced to the wild. The eggs are incubated and hatched at the Darwin Station, and the hatchlings live at the station for about 4 to 5 years. This tortoise rearing project has been a great success. Out of the 11 species that were once endangered, 10 species have been brought up to a less endangered level. The most successful story is that of the Espanola Tortoise which was saved from extinction. When the project began there were only 3 males and 12 females. Over the following 33 years these 15 tortoises produced more than 1200 tortoises which have been released into their natural habitat. What a great success story for the Galápagos tortoise! This information has helped me greatly in regards to my a level biology presentation, thanks for the help!